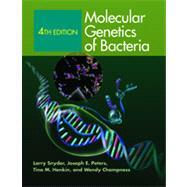 Molecular Genetics of Bacteria is the single most comprehensive and authoritative textbook on bacterial molecular genetics. Perfect for advanced undergraduate and graduate-level courses, the text presents the latest research on the subject in a clearly written and well-illustrated style. This book is intended for students and professionals in the fields of microbiology, genetics, biochemistry, bioengineering, medicine, molecular biology, and biotechnology.